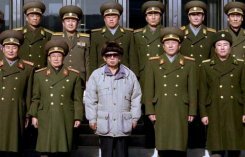 The trademark suit sported by North Korean leader Kim Jong-Il is now in fashion worldwide thanks to his greatness, Pyongyang's official website said Wednesday. Uriminzokkiri, quoting an article in communist party newspaper Rodong Sinmun, said the modest-looking suits have gripped people's imagination and become a global vogue. "The reason is that the august image of the Great General, who is always wearing the modest suit while working, leaves a deep impression on people's mind in the world," it said. "To sum it up, that is because his image as a great man is so outstanding." The article quoted an unidentified French fashion expert as saying world fashion follows Kim Jong-Il's style. "Kim Jong-Il mode which is now spreading expeditiously worldwide is something unprecedented in the world's history," the stylist was quoted as saying. The suits consist of an overall-style zipped-up tunic and matching trousers, usually in khaki or blueish-grey. The 68-year-old leader wears them even when receiving foreign dignitaries. During his outside "field guidance" trips in winter, he also dons a shapeless anorak and fur hat. Kim and his deceased father Kim Il-Sung are at the heart of a personality cult that borders on religion, with near-magical powers ascribed to the younger Kim. Rainbows supposedly appeared over sacred Mount Paekdu where Kim Jong-Il was allegedly born, and he is said once to have scored 11 holes-in-one in a single round of golf. 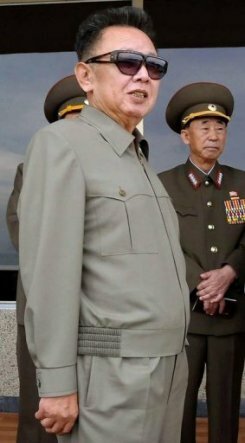 This trademark suit sported by North Korean leader Kim Jong-Il is now in fashion worldwide thanks to his greatness, says the country's official website. It quotes an article in communist party newspaper Rodong Sinmun, which states that the modest-looking suits have gripped people's imagination and become a global vogue. "The reason is that the august image of the Great General, who is always wearing the modest suit while working, leaves a deep impression on people's mind in the world," it says.